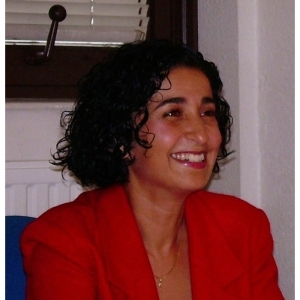 Dr. Nadia Benkirane is Research director (DR1) at INSERM (French National Institute for Health and Medical Research) and head of the “Regenerative Nanomedicine” laboratory, UMR 1260 Inserm-Unistra, Strasbourg, France. She was leader of “Active Biomaterials and Tissue Engineering” team INSERM 977. She received her Ph.D. from University Louis Pasteur, ULP, Strasbourg, France for the work on Development of pseudopeptides as synthetic vaccines. Dr. Jessel (Benkirane) then held a postdoctoral position in collaboration with the Institut Pasteur, Paris, France, working on Immunotherapy HIV, and another postdoctoral position on the application of modified peptides as vaccines against FMDV (Plum Island Animal Disease Center, ARS, USDA, Greenport, NY 11944-0848, USA). She joined the INSERM U595 in 2002 as a post-doc, and received the diploma to direct the research (HDR) in 2004. Dr. Jessel got the permanent position (CR1) in the INSERM 595 laboratory in 2004 and Research Director (DR2) position in the INSERM 977 and head of “active Biomaterials and Tissue Engineering team from 2009 until 2012). Currently Research Director (DR1) and head of the INSERM UMR 1260 (Regenerative Nanomedicine“. Dr. Jessel possesses expertise in diverse fields of molecular and cellular biology, immunochemistry, tissue engineering and biomedical engineering. In the last 10 years, she focused her research on the bio-functionalization of multilayered polyelectrolyte architectures with emphasis on the use of these architectures to induce specific cellular responses and gain control over cell proliferation and differentiation. Dr. Benkirane-Jessel has more than 138 publications (h index: 36) with peer-reviewed publications in high impact factor journals (Proc. Nat. Acad. Sci. USA; Adv. Mater. ; Adv. Funct. Mater. ; Small; Nanoletters, Biomaterials, ACS Nano), 5 chapters reviews and 5 international patents, she is a regular referee for a number of scientific journals (Nature nanotechnology, Nature Materials, ACS nano, Biomaterials, Nanoletters…). She was under the contract (Interface INSERM/Clinic 2008-2013) and she got also “Prime d’Excellence Scientifique” from the INSERM, 2010-2014 and the PEDR from the INSERM on 2016 for 4 years. Briand J.-P, Benkirane-Jessel N et al., Bioactive coatings based on a polyelectrolyte multilayer architecture functionalized by embedded proteins. Proc Natl Acad Sci USA. 1997, 94:12545-12550 (IF-9.809). Benkirane-Jessel N, et al., Bioactive coatings based on a polyelectrolyte multilayer architecture functionalized by embedded proteins. Adv. Mater. 2004, 15:692-695 (IF-21.950). Benkirane-Jessel N et al., Control of monocyte morphology on and response to model surfaces for implants equipped with anti-inflammatory agents. Adv. Materials, 2004, 16, 1507-1511 (IF-21.950). Benkirane-Jessel N et al., Pyridylamino-beta-cyclodextrin as a molecular chaperone for lipopolysaccharide embedded in a multilayered polyelectrolyte architecture. Adv. Materials, 2004, 14, 963-969 (IF-21.950). Benkirane-Jessel N et al., Build-up of polypeptide multilayer coatings with anti-inflammatory properties based on the embedding of piroxicam-cyclodextrin complexes. Adv. Funct. Mater. 2004, 14:174-182 (IF-13.325). Benkirane-Jessel N et al., Short-time tuning of the biological activity of functionalized polyelectrolyte multilayers. Adv. Funct. Mater. 2005, 15:648-654 (IF-13.325). Benkirane-Jessel N et al., Multiple and time-scheduled in situ DNA delivery mediated by beta-cyclodextrin embedded in a polyelectrolyte multilayer. Proc Natl Acad Sci USA. 2006, 103:8618-8621 (IF-9.809). Gangloff SC, Ladam G, Dupray V, Fukase K, Brandenburg K, Guenounou M, Schaaf P, Voegel J-C, Benkirane-Jessel N: Biologically active lipid A antagonist embedded in a multilayered polyelectrolyte architecture. Biomaterials. 2006, 27:1771-1777 (IF-8.312). Dierich M, Le Guen E, Messadeq N, Netter P & Benkirane-Jessel N. Bone formation mediated by growth factors embedded in a polyelectrolyte multilayer film. Adv Mater 2007, 19: 693-697 (IF-21.950). Nadiri A, Kuchler-Bopp S, Hu B, & Benkirane-Jessel N. Cells apoptosis Control by BMP-4 and Noggin embedded in a polyelectrolyte multilayer film. Small 2007, 3: 1577-1583 (IF-7.514). Zhang X, Sharma KK, Boeglin M, Mainard D, Mély Y, Benkirane-Jessel N. Transfection ability and intracellular DNA pathway of nano-structured gene delivery systems. Nano Letters 2008, 8: 2432-2436 (IF-12.94). Daubiné F, Cortial D, Ladam G, Atmani H, Clézardin P, Benkirane-Jessel N. Nanostructured polyelectrolyte multilayer drug delivery systems for bone metastasis prevention. Biomaterials 2009, 30: 6367-6373 (IF-8.806). Grossin L, Cortial D, Saulnier B, Félix O, Decher G, Netter P, Gillet P, Mainard D, Benkirane-Jessel N. Step-by-step build-up of biologically active cell-containing stratified films aimed at tissue engineering. Adv Mater 2009, 21: 650-655 (IF-21.950). Zhang X, Oulad-Abdelghani M, Zelkin AN, Wang Y, Mainard D, Caruso F, Benkirane-Jessel N. Poly(L-lysine) nanostructured particles for gene delivery and hormone stimulation. Biomaterials 2010, 31: 1699-1706 (IF-8.806). Facca S, Cortez C, Mendoza-Palomares C, Messadeq N, Dierich A, Johnston APR, Mainard D, Voegel JC, Caruso F, Benkirane-Jessel N. Active multilayered capsules for in vivo bone formation. Proc Natl Acad Sci, 2010, 107, 3406-3411. (IF-9.809).